Miami based Chef Adrianne Calvo, author of #Maximum Flavor Social, shares a recipe inspired by a recent culinary discovery. In a recent visit to the South, Calvo enjoyed her first crawfish boil, a Louisiana staple bursting with spicy flavors. A classic crawfish boil has crawfish, red potatoes, corn, and Andouille sausage. Calvo, who in 2005 coined the catch phrase, Maximum Flavor , gave the Cajun classic a global makeover by replacing the red potatoes with Peruvian purple potatoes, adding a burst of citrus with an Italian inspired Lemon Aioli, and then replaced the crawfish with shrimp for availability. And it does not stop there. Speaking of Maximum Flavor, Calvo was enthused after encountering those bold flavors and thought it be great to add another layer- a layer that can only be attained by grilling. 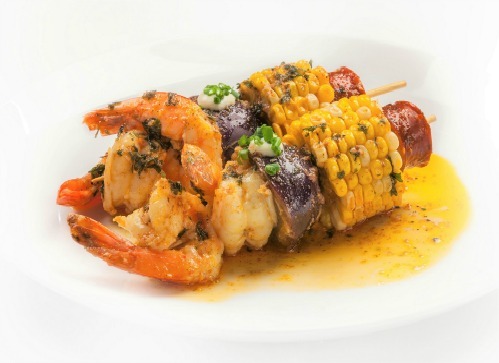 Check out Chef Adrianne's recipe for her " 'Grilled' Shrimp Boil + Lemon Aioli". This recipe makes 12 servings. Bring a very large pot of water to a boil over high heat. Add the salt, onions, lemons, garlic, and spice mix and boil until the onions and lemon soften, about 10 minutes. Add the potatoes and boil 12-15 minutes. Add the corn, cook an additional 10 minutes, then transfer the vegetables to a colander. Return the water to a boil, add the shrimp and sausage, and bring back to a boil once more. Immediately turn off the heat and allow the shrimp to soak, uncovered, in the spicy water for 20 to 30 minutes. Drain. While the shrimp and sausage are soaking up the flavor, make the lemon aioli by whisking together in a bowl lemon juice, lemon zest, honey , and mayonnaise. Set aside for serving. Fire up the grill to high heat. Skewer sausage first, then corn, followed by the potato, and finally the shrimp. Melt butter together with Cajun seasoning and slather onto skewers. Place skewers on the grill for 2-3 minutes. Enjoy. This would be a wonderful meal for a family get together. I would love to try this shrimp with the corn and potato.